Lab Physical Topology is depicted below. 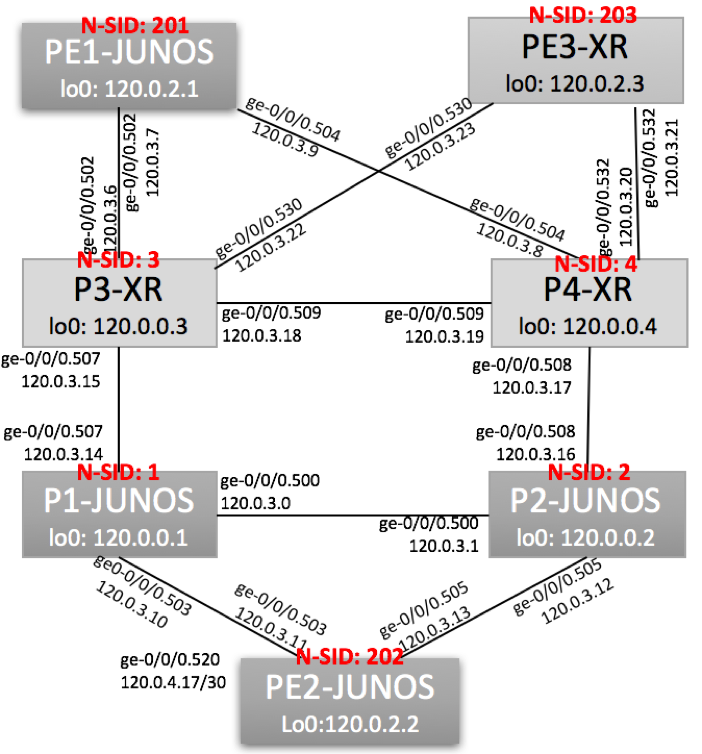 In order to demonstrate Segment Routing Interoperability, both Cisco IOS-XR Nodes (XR version 6.1.1) and Juniper Nodes (JunOS version 17.1) were used in this topology. IS-IS protocol is used to carry infrastructure Loopback and Point-to-Point routes. Single Level 2 area was used in this lab. SR was configured on all P and PE Nodes. SR was not enabled on Route-Reflectors. EBGP Sessions were configured with Upstream and Downstream Nodes. Two Route-Reflectors are configured for IPv4 Unicast Address Family. Specify SR Global Node-SID to match Juniper’s Global Block settings. From PE-3, we will validate end-to-end reachability to prefix 120.0.30.0/24 behind Downstream CE-3. CE-3 is directly connected to PE-2, customer prefix is advertised via EBGP. Label Swap 800,202 -> 800,2002 as we are using Global Node SID for PE-2 reachability. 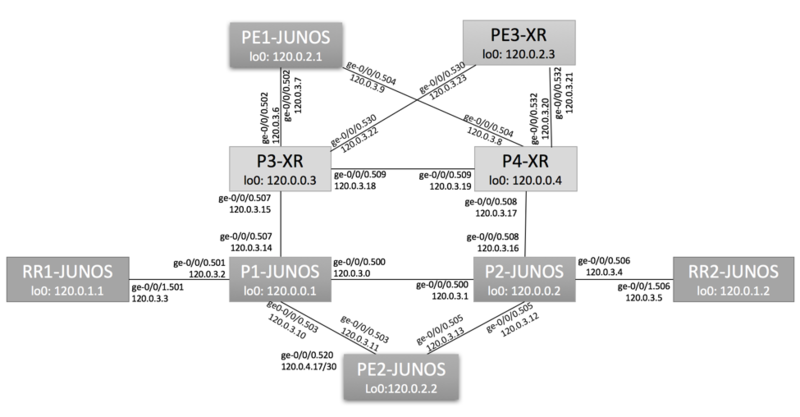 Juniper Egress PE will receive untagged traffic due to MPLS Pop action performed by penultimate nodes and will do regular L3 IP Lookup. From Juniper PE-2, we will validate end-to-end reachability to prefix 71.0.0.0/8 behind Upstream CE-9. CE-9 is directly connected to Cisco PE-3, prefix is advertised via EBGP. Cisco Egress PE will receive untagged traffic due to MPLS Pop action performed by penultimate nodes and will do regular L3 IP Lookup.